A 34-year-old bachelor/butcher is constantly pestered by his friends and family about when he's going to get married. When he finally meets a woman he actually likes, the people harassing him about finding a partner suddenly change their tune. Ohhhhhhh, how times have changed. Now, dating involves "MySpace angles" and "duck face" and profiles and algorithms that have computers doing their best to match you to a suitable partner. "Marty" takes a look at the dating scene of the 1950s, where meeting a woman meant actually venturing out into the world and interacting with people face-to-face. THE HORROR!!! 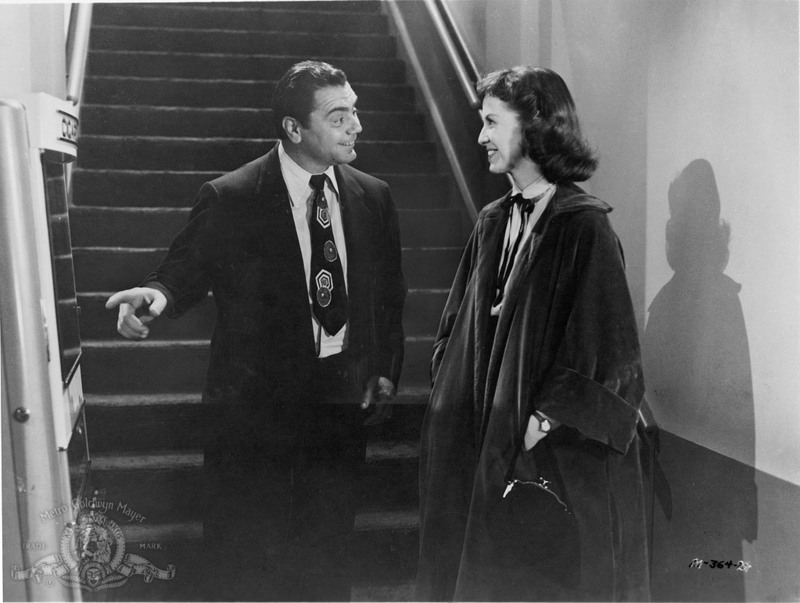 This movie boasts the directorial debut of Delbert Mann, who would go on to direct many other films such as "Fitzwilly" and "Separate Tables," though none would quite reach the notoriety of this debut. It is written by Paddy Chayefsky, who not only took home an Oscar for his work on this script but would go on to win two more Academy Awards during his career for his work on "The Hospital" and the masterpiece film "Network." 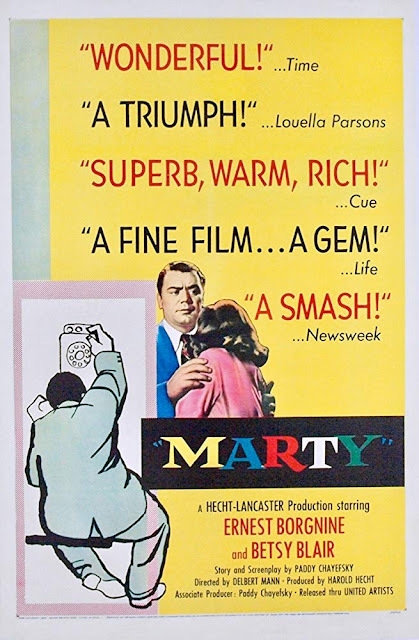 "Marty" follows a butcher named Marty (Ernest Borgnine), a 34-year-old perpetual bachelor who has just seen his younger sibling get married before him. Marty is always getting grilled and harassed by his customers, his mother (Esther Minciotti), and his closest friends about when he's going to find a woman, get married and settle down with her. One Saturday night, Marty's mom convinces him to go out to a dance hall to try and find a date. 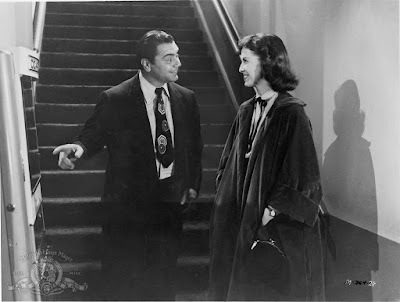 Things aren't going so well until a young woman named Clara (Betsy Blair) arrives on a blind date with a real schmuck. Her date ditches her to flit about with some other woman, and Marty swoops in like the gentleman he is to comfort her. The two of them connect right off the bat, and they spend the night chatting it up and walking around town. Marty takes a liking to Clara but is shocked when his mother doesn't like her and his friends think she's a 'dog,' which makes him start to question his feelings about her. We're so glad we're married. "Marty" is an encapsulation of a bygone era where women were referred to as 'tomatoes' and 'dogs,' and if you weren't married by the time you are 30, you were destined to be a pathetic lifelong bachelor or a dried-up old spinster. At its core, this is a simple, realistic romantic dramedy, but there is a lot of charm in this little film. 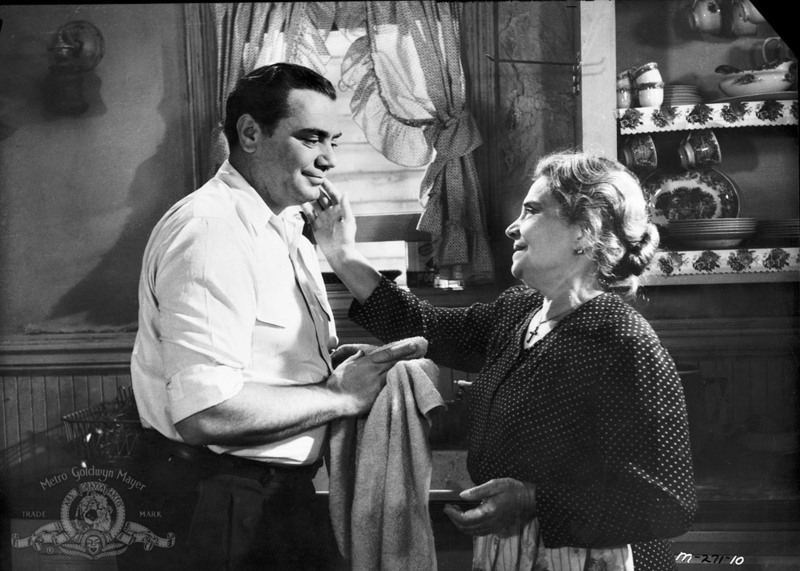 Ernest Borgnine is quite endearing as the titular Marty. He does a fabulous job playing a self-conscious character who lacks moral confidence due to a lifetime of rejection. 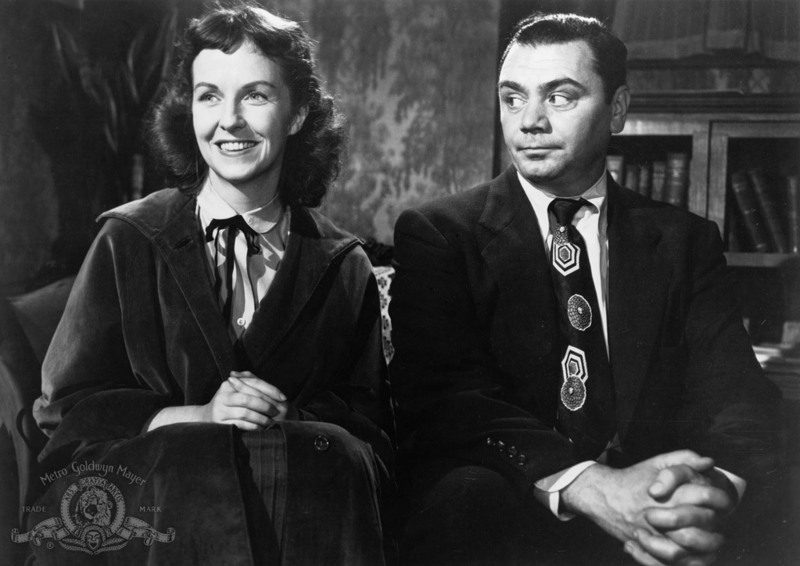 Borgnine earned an Oscar for his performance here, but equally deserving of credit is Betsy Blair, who plays the shy, timid, earnest schoolteacher Clara whom Marty falls for instantly. Blair gives a nuanced performance, and she is able to convey a lot of emotion with just a simple look. For the most part, the story is super sweet, but there are a couple of characters that just make us want to crawl through the TV and tell them to go to hell. Marty's mom and his best friend both do a complete 180 by telling him that he has to meet a nice girl and then whine when they think someone they don't even know is not good enough for him just because she's "conventional." In this respect, "Marty" has not aged well. 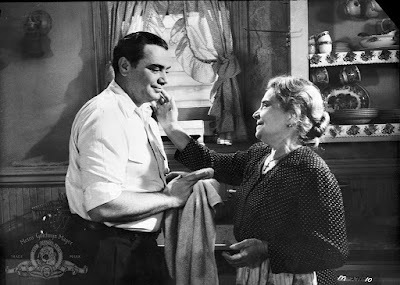 The film almost entirely deals with the objectification and mistreatment of women, as well as the rampant misogyny of the era that was then viewed as normal behavior. It was a completely different experience back then, and for the first time in a long time, it made us think that we've come quite far in the last 64 years, though things are obviously not perfect and we still have a long way to go. "Marty" was nominated for 8 Academy Awards and won 4 total, including Best Picture. It is a cute but dated romance that is worth checking out, even if it won't blow you away. Do we recommend this movie: Yes!